Snettisham at Snettisham Village01485 532610work VillageSnettisham is located 5 miles south of Hunstanton and 10 miles from Kings Lynn. There has been a settlement in Snettisham since ancient times as shown by discoveries of flints from the Mesolithic and Neolithic periods. Fine archaeological finds from the Iron Age included the Snettisham Hoard comprising around 180 gold torques found in the area between 1948 and 1973. 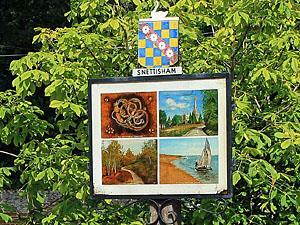 The Romans also feature in Snettisham's history. In 1985 there was also a find of Romano-British jewellery and raw materials buried in a clay pot in AD 155, the Snettisham Jeweller’s Hoard. It is said that in the 11th century, Snettisham was the third-largest town in Norfolk with seven mills, three fisheries, salthouses and 440 sheep. In medieval times business thrived and six guilds boasted their own guildhall. Today the village offers a wide selection of small boutique shops offering the standard basic amenities, and specialist services such as an arts and craft shop, picture framing, an art gallery and an old fashioned bookshop. The village has 2 pubs, The Rose and Crown and the Queen Victoria. Standing above the village, St Mary's Church dates from the 14th century. There are magnificent views of the church as you approach from the south west. Nikolas Pevsner is said to have called it "perhaps the most exciting decorated church in Norfolk". It is particularly notable for its outstanding spire (which stands 172 foot high) and would have been an important landmark for mariners navigating The Wash in earlier times. As well as agriculture, Snettisham has important quarries of Norfolk Sandstone (known as Carrstone). Worked by hand for hundreds of years, the quarries have been mechanised and commercialised to provide readily available building materials for local dwellings. There are numerous buildings in evidence throughout the area which are built of this local Carrstone. Snettisham is located 5 miles south of Hunstanton and 10 miles from Kings Lynn. There has been a settlement in Snettisham since ancient times as shown by discoveries of flints from the Mesolithic and Neolithic periods. Fine archaeological finds from the Iron Age included the Snettisham Hoard comprising around 180 gold torques found in the area between 1948 and 1973. The Romans also feature in Snettisham's history. In 1985 there was also a find of Romano-British jewellery and raw materials buried in a clay pot in AD 155, the Snettisham Jeweller’s Hoard. It is said that in the 11th century, Snettisham was the third-largest town in Norfolk with seven mills, three fisheries, salthouses and 440 sheep. In medieval times business thrived and six guilds boasted their own guildhall. On the edge of the village is Snettisham Park a very popular family attractions and well known for its herds of deer and deer safari’s. Towards the coast, less than two miles away is RSPB Snettisham reserve, a wonderful mix of bird lagoons and observations hides. On the coast itself the shingle beach looks out across the Wash with the coast of Lincolnshire just 15 miles away in the distance.